Welcome to the first part of the ISO 9001 Myth series of articles that will attempt to dispel some common misconceptions about ISO 9001. In this first installment, I will address the misperception of ISO 9001 as a documentation glut. 18. 8.2.4 Indication of the person(s) authorizing release of product. If you consider the required documented procedures carefully, you will agree that requiring six documents does not seem particularly bureaucratic. Furthermore, it is certainly reasonable for any company to have a defined and consistent method for controlling its key documents and records. Surely conducting self assessments (internal audits) to gauge how consistent, efficient, and effective an organization is at following its own business practices seems like common sense and good business practice. And having a consistent process for dealing with nonconforming products or services should already be part of any business. Finally, systematically taking action to correct or prevent problems hardly seems impractical and is not new to anyone. It would appear that you should be doing these things already. In fact, you probably are. Furthermore, you are probably doing all of the things that ISO 9001 describes. So, why is the intent of ISO 9001 so misunderstood and misapplied? While this paradigm may be appropriate for describing a documentation structure for a government or military agency, commercial enterprises rarely operate in this way. In fact, this paradigm is typically the cause of over documentation. The resulting paperwork glut quickly becomes “shelf-ware” and a burden to a business. 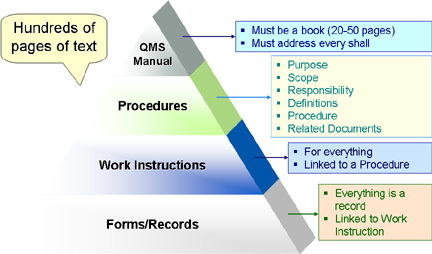 The fact is that ISO 9001 does not stipulate this pyramid of documentation. Nor does it make any suggestion regarding the form and structure of QMS documentation. ISO 9001 simply describes the minimal elements or components that a basic quality management system should have. It is simply a platform and structural framework for a quality management system, not a set of documentation requirements. As I mentioned above, you are probably doing these things already. If so, your ISO 9001 quality management system documentation should support your current business practices. ISO 9001 gives you the freedom to structure your documentation to suit your particular organizational needs. This structure gives a business the flexibility to structure its documentation in any way that makes sense for the company. For example, when a well designed form provides all of the instructions and work flow necessary to complete a particular function, as well as collect any required information, then there may be no need for a procedure and/or a work instruction. Nothing in ISO 9001 prevents you from doing this. On the other hand, if you determine that you need to have multiple layers of documentation, you have the freedom to do so too. In fact, both scenarios can exist in the same ISO 9001 compliant quality management system. This documentation hierarchy does not force you to create non-value-added documents when and where they are not needed. I agree that the standard does not create the document glut. That is self-inflicted with the rational that more is better and every contingency must be covered. I recommend that clients use flow charts with annotations for their QMS manuals. Your lean approach to QMS and EMS take it to the next level. One thing that I would recommend is that companies take the opportunity to review their business processes to make sure they reflect what the company wants, not what it exists before you create the ISO 9000 documentation. That will create a Quality Management System that becomes a road map to drive business improvements, not a required burden. Thanks for the great comments, Glenn. It is good to see in written form what you told us at our initial orientation meeting and throughout our Lean QMS development process. Coming from an unregulated industry that sells product to a very regulated industry (medical diagnostics), we initially were a bit skeptical of your approach. As we moved through the design and implementation process of our Lean QMS it became clear that we had taken the wrong approach in the past. As we moved toward our successful Stage 1 and Stage 2 Certification Audit, it became obvious that we could not have accomplished this in the relatively short period of time it took if we had followed the archaic (and wrong) pyramid approach. The result is that we have evolved a different corporate mindset. We now look for ways to simplify our documentation structure to make it more standardized and user friendly, rather than writing chapters in a book that nobody wants to read. Perhaps your most important observation is the point that multiple documentation scenarios may exist within the same ISO 9001 compliant QMS. Since our customers have Regulatory Affairs (RA) departments that expect certain written documentation, we have the flexibility to comply, where appropriate, without burdening the bulk of our QMS. Unfortunately we still must deal with businesses that misinterpret or misapply various regulatory standards (FDA QSR, ISO 13485, etc.). We are constantly told that we (as suppliers) must comply with some regulatory requirement that a customer has. 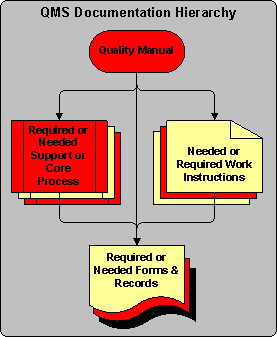 An intangible benefit of the Lean QMS approach is that we are now armed with a clearer understanding of the actual requirements and can now point out that these “requirements” are actually misapplied elements of the standard – probably introduced by RA personnel who still view the regulatory environment through the old pyramid paradigm. I think this really does a good job of explaining away the myth that ISO 9001 is just putting together a bunch of documentation for the sake of the standard. Unfortunately, I think that misconception is very prevalent and has led to ISO being a “four letter word” in some circles. Hopefully, more people will be exposed to this and related articles so that fact can replace rumor. Then people can set up a system that is beneficial to their business and not run in competition with it just to meet misunderstood intent. There should be a required mantra in ISO–KISS. ISO is all about consistency in processes. A good training and communication system goes a long way to make that happen without creating burdensome documents to cover every contingency. Just because a company creates a ton of documents doesn’t mean anyone reads or understands them. Most of the time “less is better” and flow charts and visual aides are a great way to communicate necessary information. A few key points in a flow chart will usually be taken in and understood quicker then trying to read through two or three paragraphs. And it while still communicating the same amount of information to the reader. I hear from companies on a daily basis that ISO is being pushed out or won’t be even looked at since it requires too much involvement to create the quality manual, procedures and the like. I believe that this stems largely from the “ISO in a can” models that are very document heavy. This can lead to the misconception that ISO is a “document glut”. Education on different quality systems is key and Lean approaches are becoming more and more widely sought after once clients know that it exists. ISO can be easier to implement, and maintain with a much greater return on time investment. It’s definately more than a pretty piece of paper on the wall if a system is implemented correctly and followed. Thanks for posting the article. I will use it as a source for my clients. You make a good point about RA influence. It is very similar to the military legacy I describe. The ISO 13485 standard (the medical device version of ISO 9001) is very much about regulatory compliance. In fact, ISO 13485 practically eliminates the word “customer” from the text of ISO 9001. Your example of how you are able to mitigate the RA influence when and where needed is exactly the point I was trying to make. Thanks. Thanks for the comments. I am glad that you both think this information is useful. Stay tuned for the next installment “ISO 9001 Myth #2 – Do What You Say, Say What You do.” I am going to deal with this cliche and its negative impact on ISO 9001 Implementation and Certification. What a great point. I could not agree with you more. Dead trees do not improve quality or make a business better. Thanks. Great article. Our company was going down the path that you described of documentation overload. Although we were feeling the pressure from our customers to get certified, it was very difficult to justify the overhead we were anticipating. Your methodology and guidance led us down a different path. Today our ISO 9001 QMS and Toyota Production System activities are well integrated, helping us to be a more efficient company, adding value, not overhead. Thank you, Bob. You are too kind and give me too much credit. You should really publicize what you have accomplished more. Many companies could benefit from your journey and experience. I really think RoMan could be established as a benchmark for many companies. I have been down both ISO-9001 paths. My first experience with certification came with a company who documented every aspect, including how to adjust our office chairs…pull handle up while seated to lower the seat…no joke. Our QMS manual was, quite literally, thousands of pages. It was largely ignored, as no one had the time or patience to find the section they needed. Did we get a pretty certificate to hang on the wall? Yes…but that’s all we got, other than killing whole forests to print our manuals. In fact, processes became bloated and more cumbersome rather than streamlined. My second experience took the approach of minimal documentation while maximizing performance. With a QMS manual of less than 50 pages we documented everything that was required and incorporated evaluation methods that cut the fat, increasing the quality and speed with which we produced our products. The benefits of ISO-9001 are very often lost because its seen only as a way to increase viability with clients rather than improve internal functioning. If properly utilized, the process can save money, time, and frustration for everyone involved. Hi Chris and welcome to Pinnacle’s blog. Thanks for sharing your experience. I think it is such a help to hear real-life ISO 9001 implementation experiences like yours. I hope you will come back to this blog and tell us more about your ISO 9001 QMS journey. You summarized very well what you talked to me about last year while implementing Axcel Photonics Inc’s Lean QMS. This Lean QMS made Axcel passing the ISO 9001-2000 registration audit without any non-conformance. Thank you very much. What you said is all true for I have struggled with implementing the QMS based on the documentation-centric paradigm. I truly love to see every company seeking ISO certification should use the Lean QMS approach you developed. With a Lean QMS, the certification is not just a good thing on the wall or on a website. I agree with youl that the certification is a “by product” after implementing the Lean QMS. The Lean QMS then becomes the focus for the whole company. It helps the company in a much more efficient way as a basic tool to run business and is not overhead at all. Welcome to the blog and thank you for the kind remarks. It was truly a pleasure working with Axcel. As an ISO 9001 consultant, it is very rewarding to work a company that recognizes and embraces the value added features of the Lean QMS. It is a credit to you and your management team that Axcel saw ISO 9001 and the Lean QMS approach as a business management system platform. I have a request. Would you please share your experience with ISO 9001 consultants and ISO 9001 documentation packages before contracting Pinnacle. I am sure that reading about your experience will be very useful to the readers of this blog. Thank again. I look forward to reading more about Axcel’s quality journey. You hit the ‘nail on the head’ with your article and your Lean QMS approach is, by far, the best I’ve ever experienced in establishing a value-added, business focused program. With over 25 years experience in the quality management field, I have witnessed the documentation glut bureaucracy of a quality management system. As formal Quality Management Systems have become more prominent in the business world, organizations that want to not only become certified, but also want to seriously use the QMS as a tool to drive productivity improvements, know that ‘tons’ of documentation is not the answer. The ‘smart’ companies not only develop the documentation required for certification, but also the documentation that makes sense for their organization and that are recognized and used by the associates. You are correct when you state that the documentation glut of some of the ISO 9001 systems are a carry over from the old MIL-Q-9858A days in which the military contractors sometimes believed that everything had to be documented. It was not always cost effective then, and it is definitely not cost effective now. In today’s market, Lean is definitely Mean! And a Lean QMS approach is the most business oriented approach for any organization. A properly implemented and utilized QMS will not only result in productivity improvements for key customers, but will also increase the market share for any organization! Thanks for the great post, Weylan. I cannot agree more that productivity improvements are not driven by tons documents. ISO 9001 quality management system documentation should support the function of the organization, not manage it. The military model used documentation to manage operations. Not a good fit in the modern business environment. Keep the great comments coming and thanks again. As a registration auditor I see one of the greatest contributors to the documentation glut are auditors themselves, or at least the fear people have of that one “poor” auditor. Over the last few years I have seen more than a few examples of poor documentation, the problem is that now the companies don’t want to embrace the true requirements because of their fear that a future auditor will give them a nonconformance. ISO requires continual improvement and this includes the documentation system/process. If you ever get an auditor who is so closed minded that they demand a return to the old document glut style system I recommend you review your registrar’s appeal process. Great comment, Dan. Thank you for sharing your perspective as a Lean Auditor. I have also advised my clients to not be afraid to challenge an “old school” auditor. I have never had to appeal an ISO 9001 registration audit finding, but I understand from Lead Auditor colleagues, that appeals always end in favor of the client. In my career I have had to apply more drastic means on only two occasions. The client and I have asked the auditor to leave. In these cases the Registrar bore the cost and tried to do everything possible to restore good graces with the client. Recently, I came very close to doing this for the third time in my career. The auditor introduced herself as an automotive and military auditor and consultant. This was the first bad sign. She was very uncomfortable with the Lean EMS we had used to implement ISO 14001 requirements. She simply could not comprehend a process based and visual management system. She actually said that she wanted to see “say what you do & do what you say.” The audit was tense and lacked any constructiveness. Fortunately, I was there to guide her through where and how ISO 14001 requirements were addressed. The client achieved ISO 14001 registration with no non-conformances, but had I not been there, she would have definitely pushed the client into an antiquated and non-value-added direction. I found that reviewing your Documentation Glut Myth to be both informative and interesting. Your approach and methods make sense. Thank you for the webinar last Wednesday. We will be reviewing and deciding on the ISO certification within the next 30-40 days. Thank you, Jack. I am glad you found the article interesting and the Lean QMS demonstration helpful. Don’t hesitate to get in touch with me, if you have any questions regarding ISO 9001 implementation and certification. I have the same thoughts regarding documentation: that it should be value-adding and not just to satisfy the auditor requirements. Thank you for sharing you expertise. Naturally, I could not agreem with you more, Eowmy. Thank you for visisting the blog and for your comments. Please come back again soon. I would enjoyr reading more of your comments. Very interesting blog / article. I’m a small (50 emp) company’s quality manager, and you address a lot of my day-to-day challenges. We have been certified for about 6 months and keeping the system alive is not automatic. This concise summary of which documents are actually required is great. Our assisting consultant for our QMS came from a 25000 employee company, and I’m finding out that the system he developed for us would need 10 people to run. Not an option! The systems need to be simplified, and from what I have seen it is possible. The areas where we have overhauled the QMS and still attempted to conform to the standard, are in fact showing steady improvement in our KPI’s – including the big one, profit. I’ll follow your articles with interest, they’re a breath of fresh air. Small companies are a huge part of this continent’s workforce – I read somewhere it’s about 75% – and are generally pretty poorly organized. An ISO 9001 QMS can be just the tool that is needed, but it has to be pared down to start with. Hello Steve. Welcome to the blog and thank you for your very thoughtful comment. An ISO 9001 QMS should be simplified from the traditional approach in companies of all sizes. The QMS must be scaled and rationalized to ensure that it brings tactical value to the company. Often smaller companies need less rigid controls over their processes, but large companies should apply the “KISS” method too. The key is always asking what value-add does a particular element or document of the QMS bring to the organization. If the value-add cannot be quantified or at least qualified, then that component of the QMS should be targeted for elimination. Thank you again for your comment. I think readers of the blog will benefit from you sharing your experience. I hope you will visit the blog more often and give all of us more of your experience and perspective.